Farmhouse Leone (Noto Sicily) | Home Stay holidays back to Nature? It is our field. Would you like to have a change of scene? If you are looking for a different back to nature holiday in contact with the earth and traditions, then Val di Noto in SICILY is the perfect location for your vacation. Our main aim is to accomodate you as best we can. But our pleasure is to make you feel at home comfortable and welcome! Immerse yourself into the rural life atmosphere but at the same time enjoy all the home comforts of our modern and friendly accommodation, a real home from home. We share with you our most precious experiences. Taking a walk with us in the fields and surrounding area you can learn so much about the nature, plants and herbs of Sicily. Discover Agriturismo Leone by 90 seconds emotional video. In an area of Sicily embellished by 10 sites Unesco patrimony, 590 meters high, the Farmhouse Leone offers an authentic experience for you: immerse yourself into the everyday life of a working farm of a family run business. You will enjoy the home comforts, be well taken care of and looked after in relaxing surroundings, given lots of attention and also be able to enjoy excursions in Sicily. Come and enjoy some back to basic living and have the holiday of a lifetime. In order to cultivate together an indeed intelligent tourism. Low season rates are not enforced for holiday package. Rooms with shower or whirlpool bath. Our facility is certified with a quality management system according to UNI EN ISO 9001: 2015. 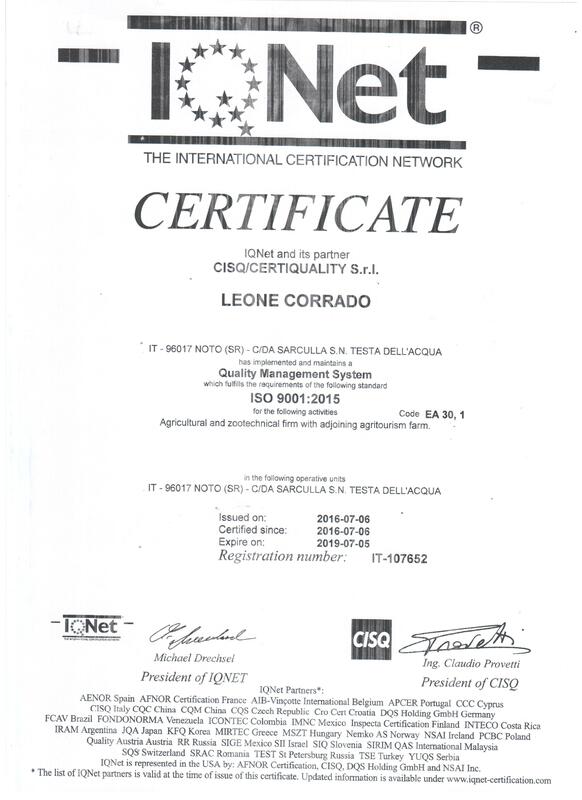 We were the first guest house in Sicily to have achieved this important certification. Staying at our farm and visit Val di Noto?